Native in Europe and neighboring regions. 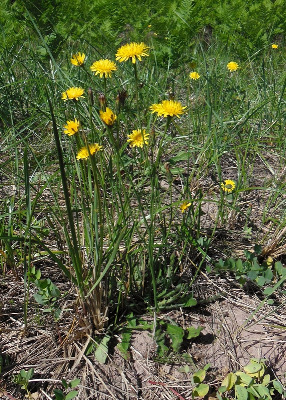 A weed of lawns, roadsides, vacant lots, fields; occasionally in prairie remnants and forested areas. 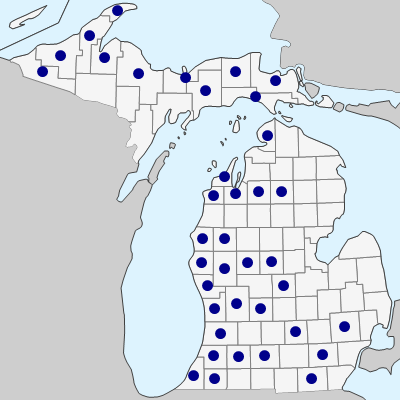 A lawn weed in Ingham Co. as early as 1886 but not collected again in Michigan until 1915 (Kent and Oakland Cos.); started spreading quite rapidly in the 1960’s. The stem is usually branched, with a few yellow heads on long pedicels. In this respect, the plants resemble Scorzoneroides autumnalis. The pappus consists of two rows of hairs, the outer shorter and sparsely if at all plumose (as in all but the outermost flowers of Leontodon saxatilis). The pappus of S. autumnalis consists of one row of plumose hairs, and the receptacle lacks the elongate, slender-tipped chaffy scales conspicuous in Hypochaeris. MICHIGAN FLORA ONLINE. A. A. Reznicek, E. G. Voss, & B. S. Walters. February 2011. University of Michigan. Web. April 21, 2019. https://michiganflora.net/species.aspx?id=379.